Every automobile comes with a battery that meets the car maker’s specifications. This battery does a good job for the conditions under which typical buyers of that particular vehicle are expected to drive. When it’s time to replace a battery, you should always choose one that at least meets the auto manufacturer’s requirements. Keep in mind that some of us GRAND ISLAND motorists drive in different ways and under different conditions. These differing conditions may require a battery with more than standard capabilities. For example, if you use your vehicle to make deliveries around GRAND ISLAND throughout the day (and that includes delivering kids to everywhere they need to be), you’ll be starting your vehicle many times a day. A starting event uses a lot of electricity – and all the short trips don’t allow enough driving time for the alternator to keep the battery at a high level of charge. That is obviously harder on your battery than say, a six mile commute to and from work in Grand Island. If this is the case, a battery with a higher reserve capacity might be beneficial. As you can imagine, it takes more energy to start a cold engine before the oil warms up and thins out a bit. It follows that if you live in NEBRASKA where it’s very cold part of the year, a battery with a higher cold cranking amps (CCA) rating could help make sure you can start your vehicle every morning. Heat is the real enemy for GRAND ISLAND car owners’ batteries. Did you know that summer months in NEBRASKA and hotter climates can literally take a year or more off the expected life of your battery? So depending on where you live, purchasing a battery with a longer warranty period may help you manage your replacement rates. In short, our battery needs vary depending on how we use our autos and the climate in which we live. 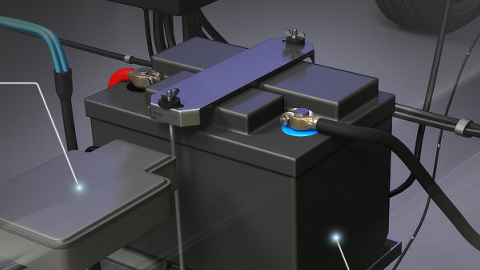 Come in and talk to your Whitaker Auto Repair tech about what battery is best for you. We can test your battery to verify its power and life expectancy so you can be prepared for the months ahead and decide if a battery upgrade is right for you. Batteries are a huge part of modern life in GRAND ISLAND NEBRASKA. I mean, how many battery chargers do you have? Of course, our purpose here is to talk about your car battery. When people come into our GRAND ISLAND NEBRASKA service center and need a new battery, they’re really not that happy about having to spend the money. But the fact is that 70 percent of batteries don’t make it for 4 years. There are some things that you can do to extend the life of your battery. First, keep it clean. If you see it getting dirty or greasy, let us know at Whitaker Auto Repair and we can clean it off. A dirty battery runs hotter and that shortens its life. If your battery terminals are corroded, let us take a look at that too. We can clean them, and if the corrosion has gotten into the battery cables, we can replace them. Because we often take short trips around GRAND ISLAND with lots of stops for errands, our batteries can end up not getting fully recharged just by driving around. That also shortens battery life. You can hook up a good quality automatic battery charger at home from time to time. We recommend charging once a month during hot months and every three months during cold months.